Economies in Southeast Europe (SEE) now appear to be solidly in recovery mode, after having one of the weakest performances in the last 5 years. The outlook has generally improved in the first half of 2015 and gross domestic product (GDP) growth forecasts for the full year 2015 have been revised upwards by around 0.3-0.5 percentage points since the beginning of the year. Economic growth should continue to improve in 2016-2020 but it should remain below the long-term potential output growth with the exception of Romania. The combination of higher private sector confidence, lower interest rates and improved labour market conditions have boosted consumer spending and investment. Consumer confidence has increased significantly during 2015 in SEE, and it is now above the long-term averages in most SEE countries, especially in Romania and Slovenia. 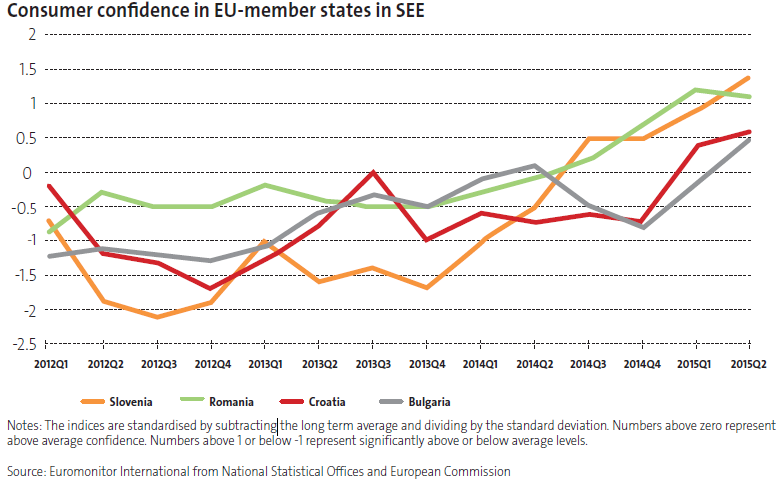 Business confidence has also increased, though it is still barely above the long-term trends in Bulgaria and Romania. Interest rates in the region have mostly followed eurozone interest rates. They reached record lows in early 2015, but have increased recently along as investors seem to have re-evaluated the impact of the European Central Bank‘s quantitative easing programme on bond yields. According to Euromonitor scenario, SEE countries should benefit significantly from lower oil prices. A forecast assuming long term stabilisation of oil prices at around $60 would still raise GDP levels in the region by 1-2% relative to $100 oil price scenario. A worsening in Russia‘s recession could hurt the outlook moderately. Based on our macro model, a 3% GDP drop in Russia in 2016 (relative to our current forecast of -0.8% growth) would reduce GDP by around 0.4% in Bulgaria and Serbia and by 0.1% in Romania. Greece‘s exit from the eurozone (Grexit) remains a high probability scenario in 2016, despite the recent 3rd bailout agreement. The spill-over effects of a Grexit on Europe should be quite limited, due to the low exposure of the European financial system to Greek debt and the improved capital buffers of banks. However, the effects would be more significant in SEE due to stronger trade links and the importance of Greek owned banks in the financial systems of Bulgaria, Romania and Serbia. We estimate that a Grexit in 2016, could reduce output in 2016-2017 by 1% in Bulgaria and by 0.3% in Romania.